Derick Baegert was the principal figure in a family of painters working in Germany in the last third of the 15th century and the first third of the 16th century. His style is based on elements derived from late Gothic painting, combined with references to Netherlandish art. The five panels in the Museo Thyssen-Bornemisza were part of a large composition of the Crucifixion that was broken up at an unknown date. All the panels reflect the influence of Rogier van der Weyden, evident in the use of luminous colours and the importance given to detail. The whole composition has been hypothetically reconstructed in a variety of different ways, taking into account three other works by Baegert. In the reconstruction proposed by Ferdinand Köhler, the five panels in the Museo Thyssen-Bornemisza would be arranged in the following order: on the left side, Christ bearing the Cross above, and Saint Veronica and a Group of Knights below; in the central part, The good Centurion, located between Christ’s Cross and that of the Bad Thief, which can be made out in the upper two corners of the panel; Mary Magdalen would have been kneeling next to the Bad Thief’s cross; while on the right of the composition was Knights and Soldiers playing Dice for Christ's Robe. 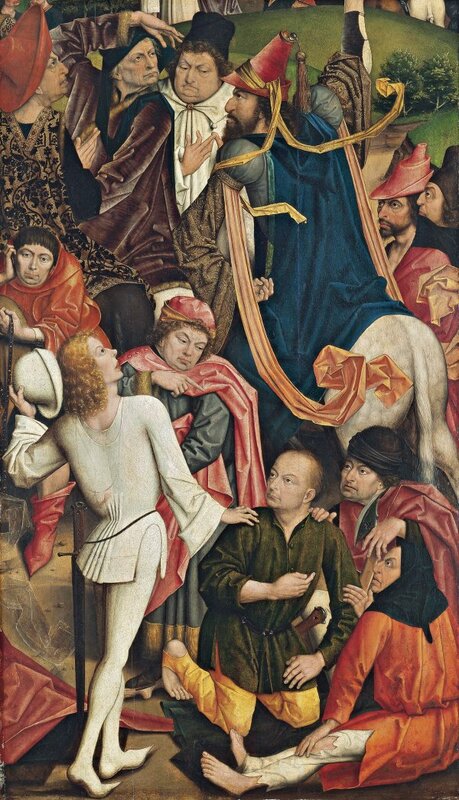 A contemporary of Johann Koerbecke, Derick Baegert was the leading 15th-century artist in the Lower Rhine area and in the city of Wesel where he was possibly born and where he worked. The first known reference to Baegert dates from 1476 in Wesel and relates to a standard commissioned by the City Council. Little is known of the early training of this artist who had a workshop in which his son Jan worked, as did Jan Joest. Baegert’s most important works were executed in Wesel and Kalkar for clients of elevated social status. The present five panels formed part of a Crucifixion that was dismantled into separate scenes and groups at an unknown date. The entire ensemble was commissioned by the Nikolauskirche in Wesel, which was near Baegert’s house. The artist was paid a total of 370 Rhenish guilders. To judge from the size of the surviving fragments and from other similar surviving works by Baegert, the entire composition may have measured more than 200 cm high by 400 cm wide. The document that records payment to the artist, dated 1477, has been used to determine the date of the work. 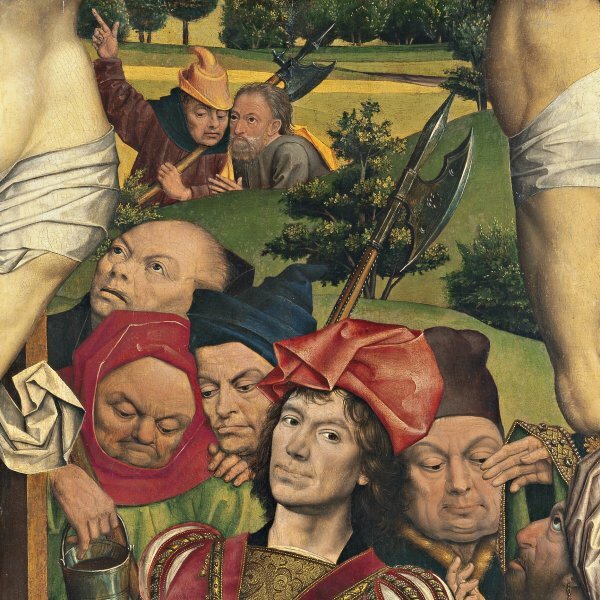 Stange suggested that a sixth panel of the head of Saint John in the Karlsruhe Kunsthalle formed part of the Crucifixion but it is difficult to fit it into the compositional scheme due to its proportions, although Lübbeke suggested that it may have belonged to a secondary scene on one of the wings. The five panels entered the Thyssen-Bornemisza collection at different dates and with different provenances. The first to arrive was the fragment with The good Centurion, which was in the collection by 1929 and was included in the major exhibition in Munich in 1930. The group of Knights and Soldiers playing Dice for Christ's Robe arrived in 1934, followed two years later by Saint Veronica, which fits perfectly below the fragment acquired in 1937 from a private US collection depicting Christ bearing the Cross. Finally, in 1952, the panel with Mary Magdalen was acquired. The fragments of this large Crucifixion have frequently been used as examples of the dedication of the Thyssen-Bornemisza family as collectors, given that four of the panels were purchased by Heinrich Thyssen-Bornemisza and the fifth and last by Hans Heinrich Thyssen-Bornemisza. The entire composition of the Crucifixion, painted for the church of Saint Nicholas, has been hypothetically reconstructed on two occasions using three other remarkable works by Baegert as reference points. The first reconstruction was by Hans Kisky and the second, with some minor corrections, was by Ferdinand Köhler. If we focus on the latter, the fragments in the Museo Thyssen- Bornemisza should be arranged in the following manner: Saint Veronica and a Group of Knights occupies the left side of the composition; the fragment with The good Centurion would be located between Christ’s cross and that of the Bad Thief; Mary Magdalen would be kneeling next to the cross of the Bad Thief;and the composition would terminate on the right with Knights and Soldiers playing Dice for Christ's Robe. Similar arrangements are to be found in the painting of the same subject by the artist in the Propsteikirche in Dortmund and the large Crucifixion that was lost in World War II of which photographs survive (formerly Deutsches Museum, Berlin). The Dortmund painting is the oldest of the three and has been dated between 1470 and 1475, while the Berlin Crucifixion has been dated to later than the Wesel one, to around 1485. The third example used for comparison with the Thyssen-Bornemisza panels is in the Alte Pinakothek in Munich, but in this version the artist modified the composition and the figures. It is dated 1500. The present fragments are a faithful reflection of the style and quality of Baegert’s work in which his skill at relating narratives on a large scale is clearly evident. The artist organised the different figures that accompany the principal narrative into groups that link up and interweave through their gestures and gazes. One such example is the group of Knights and Soldiers playing Dice for Christ's Robe. Here the knight dressed in white, who acts as a counterpoint to the figure of Saint Veronica, rests his hand on one of the soldiers while looking at the group of riders above him on a higher plane. The colours are luminous and intense with a preference for warm tones. Baegert’s technique is meticulous and is applied in a uniform manner throughout the different planes of the composition. In each of the fragments from this great Crucifixion it is possible to detect the marked influence of Flemish painting, in particular that of Rogier van der Weyden. Two drawings in the Musée Condée in Chantilly, one of female heads and the other of male heads, have been related to the figures in this work. Two figures in the first drawing can be related to Saint Veronica and to the woman looking out at the viewer and pointing to the Holy Face, while figures in the second drawing relate to the faces of the knights that would have occupied the right side of this immense composition, according to the reconstructions.